Feathers For Kids | Recycle Your Feathers! This year the Aboriginal Arts Collective is spearheading a project to recycle feathers!! As you know, feathers, bone and hide are very important to Indigenous artists. Unfortunately, in our more urban communities, they are not easy to come by. We find it very disturbing that people are using imported and manufactured feathers to create traditional pieces and so we have initiated a project that will allow our community members to use authentic materials. No more 'made in China'...please!!! Our students in the Classroom Art & Knowledge Exchange Program are learning about sharing circles and we use decorated feathers in these activities. Hundreds of children would learn from these feathers. Beyond our own classroom work, we will be facilitating workshops at this years Summer Solstice | Aboriginal Day celebrations in Ottawa. This event sees over 6,000 students on Education Day and has over 12,000 visitors in all. An excellent education and marketing tool for businesses involved in my initiative - and it explains our need for large quantities of feathers! So if you're a hunter, please don't throw out your feathers! If you are able to pluck your feathers that would be great, otherwise, please consider just removing the wings and tail and freezing them until we can pick up. Depending on where you are located, next day pick up is possible. If you are remote, or we are not in your area, we will arrange pick up within a week. In the Ottawa area, we now have 4 drop off locations! Gourley's Variety in Renfrew, Ontario. Al's Corner Store in Arnprior. Griffith General Store in Griffith. We don't want to bother you - this must be as easy as possible. If you'd like to leave your feathers at the end of your driveway on pick up day, we'd be very happy just to drive by and grab them. We will pick up your wings and tails in southern and eastern Ontario - all you have to do is text or email us!!! Talking / Sharing Circle Feathers. 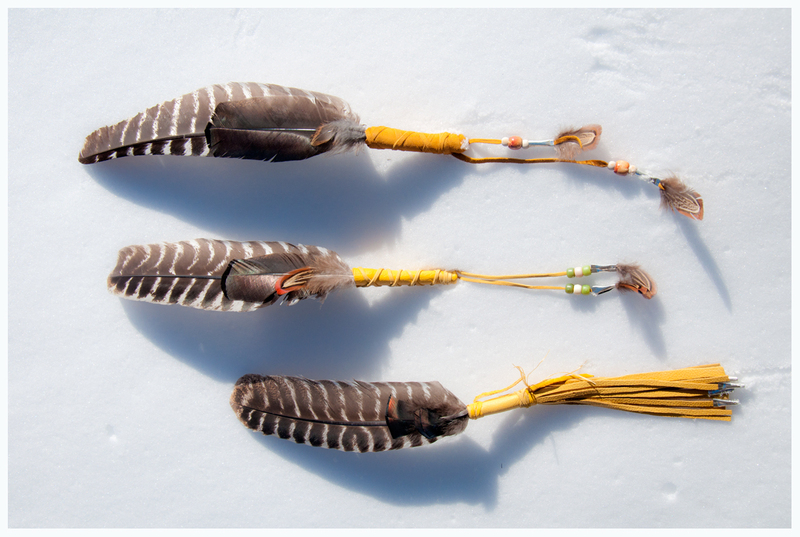 These are turkey feathers decorated with leather and beads. They were made by First Nations teens in a Pass The Feather workshop. Sharing or Talking Circles build a sense of community in which students, teachers, parents, assistants and volunteers feel that they are seen, heard and respected. They support problem solving and fairness through understanding. Students that participate tend to shift problem-solving responsibilities from their teachers on to themselves and their peers. These Circle Talks originated with our ancestors and First Nations leaders. The circles ensured that everyone had a turn to voice their opinion uninterrupted. Usually a question was presented by the Chief or leader/elder of the circle and the talking piece would be passed around the circle so that each person could share their perceptions or opinions on the subject matter. When we sit in a circle, we are building a stronger sense of community that supports honest dialogue. A talking piece is usually used in Sharing Circles. Your talking piece is a turkey feather that has been hand decorated. Talking pieces can be anything that is easily passed from person to person but is most often something natural and beautiful such as shells, stones or driftwood. As the educator, you are the ‘circle keeper’ and keeper of the feather. You will lead the conversation and when you are finished speaking, you will pass the feather to the student/person on your left. The circle keeper (educator) will ask a question and invite everyone in the circle to respond. Use open-ended questions – ones that are not easily answered with a simple ‘yes’ or ‘no’. Circles have a centre and it is an important element as participants often speak into the centre. It’s more powerful when something is placed there to provide focus. Teachers can have a box of objects and the children can arrange them on a round piece of fabric. A bowl of water can also help by bringing a sense of calm to the circle and collects the wisdom of the speakers. Only one person may respond at a time. The one who is responding is holding the feather and the others are to remain quiet at that time. When the feather comes back to you, you will store it in a safe space for the next day. Everyone should feel safe to express themselves in the circle.. This is a practice of respect and trust. It may also give you insight into your students’ personality. Not everyone in the circle has to speak. The feather can respectfully be passed to the next person if the holder does not have anything to add. In your learning spaces, you can introduce sharing circles to your students to create trust and enhance your understanding of the students your work with. Who do you consider a hero (from real life or movies) and why? If you had a day off of school, what would be your favourite way to spend it? What do you feel like when someone is angry at you? What would you NOT want to change about your life? If you would like more information on Talking and Sharing Circles, please contact a local knowledge-keeper or elder. You may also contact 'Pass The Feather' and we may be able to refer you to literature or someone in your area that can help.